Japan Immigration Law Practitioners Association (JILPA) is the first Immigration law study group in Japan for professionals. 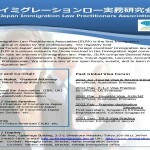 We regularly hold ‘Global Visa Forum Japan’ and discuss regarding foreign countries’ Immigration law and practice. JILPA is a unique resource for those involved in the immigration legal community in Japan, or with an interest in immigration law. JILPA mainly comprises General Attorneys (Immigration Lawyer -Gyoseishoshi ), Researchers, Travel Agents, Lawyers, Accountants and other Professionals. Non-members are welcome to any of our open forums and events to learn more about immigration law. Copyright ©2019 イミグレーションロー実務研究会 All Rights Reserved.